2007 was an interesting year for animated features. This was a year that saw Pixar’s biggest winning streak kick off in the form of Ratatouille (which followed up the good but not-up-to-studio-standard Cars), as well as international critical darlings like Persepolis and Paprika. It was also the year that saw Dreamworks’ Shrek franchise fall from grace. Somewhere along the way Dreamworks released another animated feature in 2007 in the form of Bee Movie, a film that – despite some solid efforts at humor – feels decidedly bland and average. So much so that it’s only real legacy is that its entire script became an internet meme a decade after release. 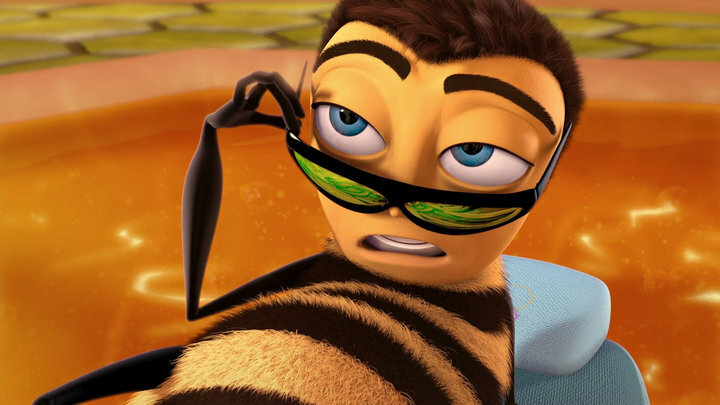 Interestingly, Bee Movie was something of a pet project of one Jerry Seinfeld, who helped write its screenplay, served as producer, and starred as the voice of our bee hero, Barry B. Benson. It is Seinfeld’s comedic knowledge that provides the film’s few highlights, but it’s a real shame that he didn’t weave the same level of originality and wit into the overall screenplay that he did to his iconic (and brilliant) TV series. The film begins the same as every single CG animated film that thinks they know the Pixar formula (but doesn’t): Barry B. Benson doesn’t quite fit in with the other bees in the hive, wanting to experience life to its fullest instead of being relegated to a single job for the entirety of his life. Of course, following the rulebook of CG animated films to a tee, Barry decides to venture outside the hive for a change of pace, and breaks ‘bee law’ by talking to humans, and soon becomes infatuated with a human flourist named Vanessa (Renee Zellweger). A human/bee romance is as weird as it sounds, but at least Barry is given actual human traits and a personality, so it’s still less awkward than The Shape of Water. Anyway, Barry soon learns that food companies are selling and distributing honey, without permission from bees! And so Barry sets out to sue the human race so that bees can have full control over their product. It’s a pretty strange plot, and though I do commend it from swerving away from the impossibly cliched “social misfit follows his dreams” story of CG animated films, the whole first act feels kind of pointless since that setup ultimately goes nowhere in favor of the honey-based plot. I’ll tell you why, Vanessa. Because Ken is a human, and Barry is a bee. Am I getting sidetracked and overthinking things? Maybe, but I do think that just because a movie is aimed at children doesn’t mean it should talk down to its audience by not thinking through its finer details. Even with the gaps in logic and awkward romance, there are still other elements holding Bee Movie back. Its character designs not only look basic and uninspired, but the animation itself looked well behind its time, being more akin to a late-90s CG animation than something that was released the same year as Ratatouille. And if the first act is largely forgotten with its original setup, then the third act is just downright confused as to where it’s going, including a completely unnecessary action sequence in which Barry and Vanessa have to land a plane after the pilots get knocked out. The saving grace to Bee Movie, however, are a few moments where Seinfeld’s comedic genius shines through. Sporadic though they may be, the moments that hit the right comedic notes do so with a wit that is to be expected of Seinfeld and company. There are a lot of missed shots as well (the early moments in particular have a heavy emphasis on bee-based puns), but it sticks the landing when it comes to a few moments of more mature humor at the expense of things like lawyers and less-than-tolerant older generations (“your parents would kill you if you were dating a wasp”). We also get a fun but small role by John Goodman as the voice of the lawyer representing the humans. Goodman has one of those voices that just sounds perfect in animation, to the point that his presence is always a highlight. Bee Movie is far from the worst animated film I’ve seen. In fact, it’s far from the worst Dreamworks animated film I’ve seen. But for those few brief moments that are worth the laughs, the movie just feels far too bland to truly stand out. The fact that many of the folks who worked on Seinfeld’s television series helped bring this film to life only hurts it all the more, since you know they were capable of doing so much more with it. Instead, they decided an animated film wasn’t worth their extra effort, I suppose. That’s a shame, because Bee Movie might have been more than an internet meme otherwise. I went to watch this out of my love for Seinfeld. Needless to say, I was disappointed. Honestly, the only remotely interesting thing about the film is how it somehow exploded to be some sort of joke of the week last year, and that somehow, any video you see with people discussing over a piece of media from Bee Movie manages to have more bee puns than the movie itself.